A state judge said Tuesday she’ll rule on the legality of Louisiana’s big cat ban after hearing arguments from attorneys for the state, an animal rights group and an Iberville Parish truck stop owner who wants to house another tiger at the facility in the wake of Tony the tiger’s death there last fall. 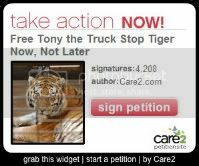 The 2006 state law bans private ownership of large and exotic cats, but Tony — who was euthanized in October — was living at Tiger Truck Stop in Grosse Tete several years before the ban went into effect. A measure passed during the 2014 legislative session and signed into law by then-Gov. Bobby Jindal allowed Tiger Truck Stop owner Michael Sandlin to keep only Tony. The law said Sandlin could not obtain more tigers after Tony dies. Sandlin contends the state’s 2006 big cat ban is unconstitutional; the state and the Animal Legal Defense Fund maintain it is legal. District Judge Janice Clark, of Baton Rouge, met in her courtroom Tuesday with attorneys for the state, the ALDF and Sandlin and set up a schedule for them to deliver written and oral arguments to her. Clark said she would issue a ruling after all arguments are presented to her. She did not set a date for the oral arguments or ruling. ALDF lawyer Tarak Anada said outside the courtroom that the advocacy group is aligned with the state when it comes to Louisiana’s big cat ban. It forbids anyone other than colleges, sanctuaries, zoos, wildlife research centers and scientific organizations from possessing big exotic cats. “The big cat ban is constitutional,” he said. Geoffrey Ormsby, one of Sandlin’s attorneys, said no one disputes the need for regulation when it comes to big cats. Robert Morgan, who also represents Sandlin, said Tony was “much better off” while he lived on the truck stop grounds. Sandlin, who was not in court Tuesday, said in a telephone interview he is waiting for a taxidermist to stuff Tony, who lived at the truck stop for 17 years, so he can be displayed at the facility. Tony’s remains were buried in a coffin, he said, but his fur was returned to Sandlin. “People need to be able to experience these animals,” he said. Tony, a 550-pound Bengal tiger who struggled in his later years with arthritis, was euthanized after he took a sharp decline due to kidney failure, Sandlin has said. 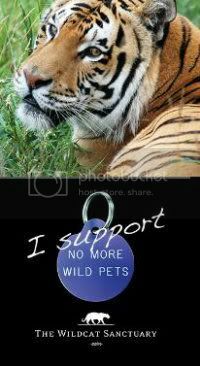 The tiger had stopped eating and taking medication. Sandlin has exhibited tigers at the truck stop since 1984. He has held a federal permit to keep tigers there since 1988. ALDF was in court in their case under the Freedom of Information Act to obtain records on Tony from the USDA in an expedited manner. The case raises the legal question of whether Tony was an “individual” under the Freedom of Information Act. ALDF’s litigation to keep Michael Sandlin from getting another tiger is also on-going. Individuals? Absolutely. 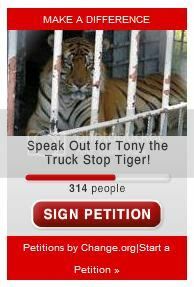 Tony was a majestic sentient being exploited for 17 years – caged as a roadside attraction at a truck stop. 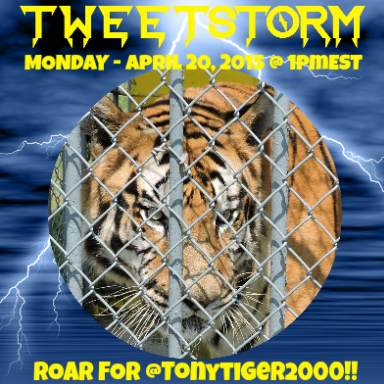 Tony raised global awareness to the plight of captive tigers and big cats in the United States. 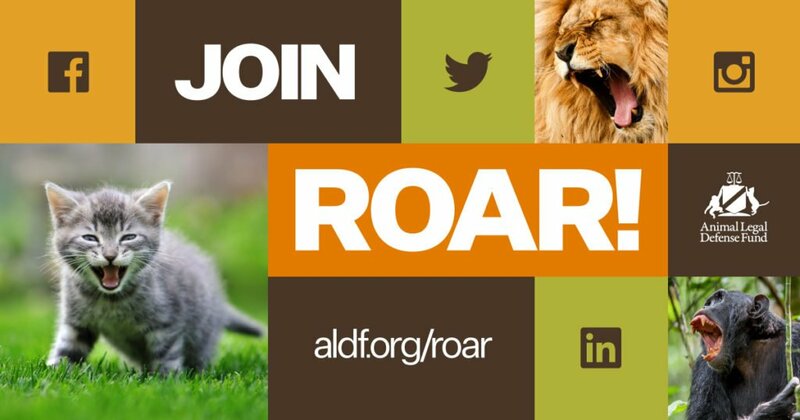 We (Tony’s Friends) will always be grateful to ALDF and their unwavering commitment to Tony and his release to a reputable big cat sanctuary. 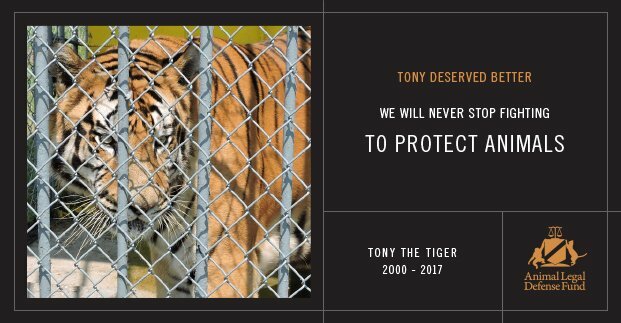 In Tony’s honor and memory we know ALDF will keep fighting for captive tigers, big cats and all animals who deserve our protection and respect.